...accomplished rang in my ears this morning as I listened to the BBC's John Simpson's interview with General David Petraeus. Petraeus said that the battle against the Taliban in Afghanistan has turned in favor of the allies and that they are on the run. This followed a statement by Simpson that rumor had it that the Taliban was winning. Petraeus in my mind was standing on the deck of a ship with a banner saying, "Mission Accomplished" as did former President George W. Bush many years ago about the victory in Iraq. 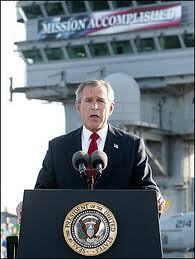 George W. Bush was so very wrong as he was so much of the time. My only wish is that Petraeus will be right. I really like General Petraeus but then again I also liked General McChrystal so what do I know?